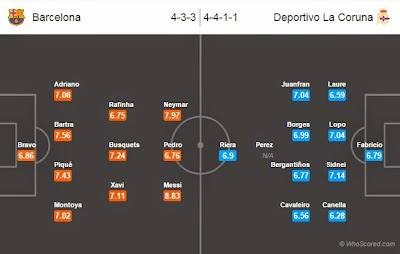 La Liga Champions Barcelona will host Deportivo La Coruna in the final game of the La Liga tonight at Camp Nou. Luis Suarez remains a doubt for this game due to injury, he might not be risked in this game as Barca eye Champions League trophy. Boss Luis Enrique is likely to give Xavi a start as this will be his final game at Camp Nou. Martin Montoya, Marc Bartra and Rafinha are expected to get some minutes. Boss confirmed that Thomas Vermaelen will feature in this game. Cezary Wilk and Manuel Pablo are both out through injuries. Luisinho is suspended for this game. Pablo Insúa and Luis Fariña are doubtful for this final game. Meanwhile, Roberto Canella is likely to to start at left-back role. Ivan Cavaleiro is expected to start ahead of Diogo Salomao in the midfield role. Barcelona are undefeated in their last eight home games against Deportivo in La Liga. Barcelona have kept clean sheets in all of their last four home games against Deportivo in La Liga. Barca are unbeaten in their last six La Liga home games. Deportivo have not won a game in their last eight away La Liga games. Barcelona 4 – 0 Deportivo La Coruna, Lionel Messi to score a brace. This match would not be important enough for the home side but their win can take Deportivo to the relegation zone.